Every 4 years, the Olympics bring us together to witness the best in human endurance, athleticism and sportsmanship. This week as medals are won and each country’s tally grows, there is one team that has its sights on a prize outside this world. They have trained for years, learnt from past exploration missions, used the latest and some of the most remarkable innovative technologies and perfected instruments to excellence. Now they wait for their dream machine to perform what it was built for – land on the Red planet and do science. Curiosity will land near the Martian equator at about 10:30 pm Aug. 5 (PDT). Coverage begins about two hours before landing. NASA engineers have performed the final trajectory correction that MSL is likely to need to enable a successful targeted landing at Gale Crater. 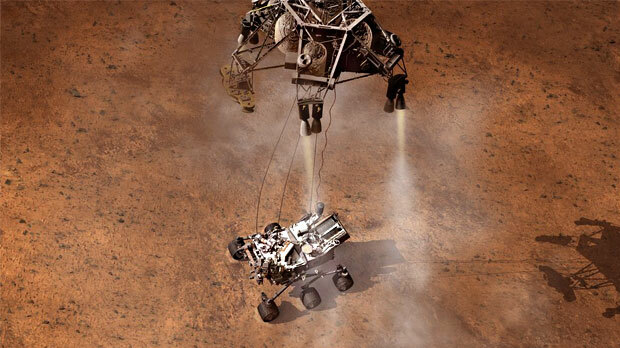 If the success of Spirit and Opportunity, the Mars Exploration Rovers that began exploring Mars in 2004 are anything to go by, NASA engineers are expected to out-perform expectations. Let’s wish them the very best and hope the landing goes to plan. In the meantime, the scientists have begun sharpening their pencils (if they still use them!) and clearing out their emails. They are getting ready for the data stream from the red planets to come through. Thanks to the way Curiosity is packaged up, it is primed to begin science operations almost as soon as it lands. Curiosity brings with it the biggest, most advanced suite of instruments for scientific studies ever sent to the Martian surface. The car-sized marvel for human ingenuity has a prime-mission period of two years. It is worth noting that Curiosity has not been designed to detect life but rather assess the potential for life. If successful, this mission may open the door for a future mission with the potential to detect whether or not life may have ever existed on Mars.